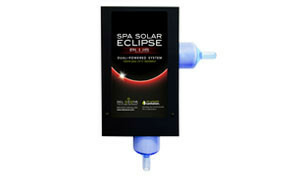 Through the combination of Corona Discharge Technology, Germicidal UV Light, and DEL's Advanced Plasma Gap technology, the DEL AOP lineup for hot tubs and swim spas provides Advanced Oxidation Process in powerful, compact systems. Advanced Oxidation Process refers to a variety of treatments that work together to sanitize and disinfect water by oxidizing organic and inorganic contaminants. The concept is similar to the use of ozone for disinfection, but AOPs go beyond standard treatment methods since they produce hydroxyl radicals. Hydroxyl radicals have a higher oxidation potential than any other substance, with the exception of elemental fluorine, which is not safe for direct human applications. In AOP systems, the highly unstable hydroxyl radicals react with dissolved waterborne contaminants in a series of strong oxidation reactions. This process happens almost instantaneously. AOP systems are synergistic in the sense that they multiply the power of the precursor oxidants (like ozone) to yield more disinfection potential than the sum of the input taken separately.